Anthony Mazzerina scored just 1:29 into overtime to give Wayne Valley a 2-1 win over Hawthorne in the Passaic County Tournament’s Round of 16. HAWTHORNE – Soccer is worldwide known as the beautiful game for the array of dazzling tricks on the ball, intricate passes and incredible goals scored in the run of play. However, in a high school soccer match played on a bumpy grass field the method of attack has to be altered. After being deadlocked through 80 minutes of regulation against Hawthorne, Wayne Valley was not worried about making the game pretty. The Indians were trying to simplify the game as much as possible by merely getting the ball into the box and trying to make something happen from there. The direct tactics clearly worked as the Indians wasted no time delivering the game-winner in overtime. Just 89 seconds into the first extra session, Anthony Mazzerina pounced on a rebound and ripped it into the upper left-hand corner as 11th-seeded Wayne Valley pulled off a 2-1 upset of No. 6 seed Hawthorne in the Round of 16 in the Passaic County Tournament on Wednesday in Hawthorne. “It was frustrating that we couldn’t play the game we wanted to play but we kept grinding until something clicked,” said Michael Bleeker of Wayne Valley. Over the first 22 minutes of match, both defenses were dominant as each team could only muster one shot over that span. That was until a long throw-in was pinballed around in the box before TJ Cilvick was there to clean it up to give Wayne Valley a 1-0 lead. Janbo Kaghado had the goal for Hawthorne, the No. 6 seed. Hawthorne (5-6) struggled to keep possession throughout the first half but kept hustling up front. The Bears were rewarded with a penalty kick for a takedown in the box. Janbi Kaghado drilled it into the lower left-hand corner with eight minutes to play in the first half, tying the game at 1. After flurry of activity over the final four minutes of the first half, the back-and-forth play continued after the break. Wayne Valley had a pair of great chances when Bleeker, the best player on the field for either team in this match, made a run from the back and had successive cracks at goal. He was stonewalled on both shots by point-blank saves from Hawthorne keeper Benett Megnin. The Bears had four corner kicks in the final 10 minutes of regulation with three of them being dangerous across the goalmouth. 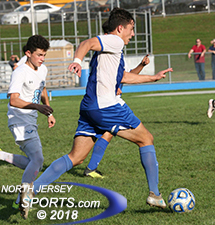 They unable to connect at the back post on all three of those chances and the game headed toward overtime to decide which team would advance in the Passaic County Tournament. Michael Bleeker and Wayne Valley will meet Passaic in the quarterfinals. Two years ago on the same field, Hawthorne beat Wayne Valley in overtime in the quarterfinals of this tournament. This time around it did not take the Indians long to turn the tables. Wayne Valley needed one push up the field to put an abrupt end to a hard-fought game. Bleeker played a through ball that Christian Prossillis ran onto. He got off a shot that forced Megnin into a diving save and he got to his feet as the ball rolled towards the top of the box. 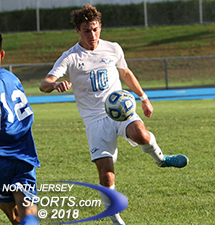 There was little he could do, however, as Mazzerina ripped the ball first-time into the upper left-hand corner just 1:29 into overtime to get Wayne Valley through to the Passaic County quarterfinals. Wayne Valley (4-7-1) will take on third-seeded Passaic next Wednesday for a berth in the semifinals. Having already exceeded expectations and having won three of their last four games (with the lone loss coming against current Passaic County champion Clifton), the Indians feel they will be a tough team to knock off from here on out.